Friendlier tracebacks, translated into various languages, is only one of many things that AvantPy can do to help beginners learn programming. AvantPy is very much in its infancy. You can think of it as a proof-of-concept that can be built upon. Yesterday, on the PSF's blog, some information about a request for proposal has been posted. I have jotted down some thoughts about AvantPy in this context. If you wish to add your own thoughts on this, you can do so here. I do not wish to get any direct funding from the PSF for this project. However, some potential collaborators might need some financial support depending on their goals. Here are some useful links if you want to find out more about AvantPy. Contributors to the AvantPy project are very much welcome. This works well. However, if Reeborg has to retrace some steps, to accomplish the task, the two arrow heads visually combine and appear to form an X which could be interpreted to mean that a given path segment should not be included. (In addition to the arrow heads combining to look like an X, the dashes do not overlap and instead combine to form a solid line.) Most users of Reeborg's World are students learning in a formal setting. I surmise that those teachers quickly figured out what the correct information was and never reported it. As I created this visual information, I knew its meaning and was simply blind to the other possibility. A while ago, a user learning on their own asked me why their program was not working. After a few email exchanges, I finally understood the source of the confusion. I took note of it. I had a quick stab at finding a better way but it didn't work. In addition to clearing the confusion (or, I hope it does), I actually think it looks much nicer. This improvement would not have been possible if I didn't get some user feedback. This is why I am always thankful when someone contact me to suggest some improvements -- even though I may not always be in a position to implement the required changes quickly. Playing with experimental and an old recipe created by Brian Beck. Just having fun ... Please, do not even think of using this for serious work. This blog post is long. I've attempted to provide enough details for you to determine in each case if my use-case corresponds to yours and thus if and when my recommendation might make sense for you and your project. I started working on Reeborg's World many years ago. The first version was created as a desktop program (rur-ple) in 2004. My first primitive attempt at a web version was done around 2007. During the years I have worked on it, tools and libraries have come, evolved, and gone, to be replaced by better ones. As programming is only a hobby for me which I work on when I have some free time, I cannot afford to change the set of tools I use every year to follow the latest trend. I've started working on the current version when using color gradients for buttons and menu bars was the latest and coolest thing - well before the current flat UI became the norm. Admittedly, my site looks dated - but since I do not have enough time to add all the new ideas for functional improvements I want to make, investing time to modernize the look is not a priority. Some of the complexity is required as I want to make it easier for would-be collaborator to add new programming language or paradigms for learners  or additional human language support . However, it is likely that some of this tangled mess could be simplified with a significant effort. In addition, there is more to Reeborg's World than a single site; there is also a basic programming tutorial available in three languages  with additional languages in the works, a Teacher's Guide , an API documentation for advanced features , and more . Each of these act almost like an independent project pulling me in different directions. In order to preserve my sanity, as my project slowly evolves I need some constancy and simplicity in the tools I use. I also knew that I wanted the ability to have floating windows for additional menus and dialogs. After examining a few choices, I settled on jQuery UI, since there was good documentation for it and an active community ... and I was already using jQuery which meant a smaller footprint than some other alternatives. Libraries like jQuery and jQuery UI can be included with a link to a CDN (Content delivery network) which can reduce the load on the server where my project lives. I can also link to a specific version of these libraries, which means that I do not have to update code that depend on them (except if security issues are discovered). 10 years later, both libraries are still alive and well and I haven't needed to make any significant changes to any code that uses them. However, as I learned more about npm, I found that, together with a very simple batch file it could do all the automation that I needed in a very, very simple way, by defining "scripts" in a file named package.json. Chaining tasks with npm scripts is a simple matter of "piping" them (with the | character). Since I had already installed npm, it became an easy choice. browserify can be installed using npm. Sigh ... I find testing boring ... But, as my project grew larger, it became necessary to write some tests. It is only by accident that I came accross tape as a testing framework that felt "right" to me. I like my tests to look like my code. With Python, I would use assert statements to ensure that the a function produces the correct result. My favourite unit testing framework for Python is, not surprisingly, pytest. I make use of "assert.plan()" to ensure that the number of assertions tested matches my expectations. It was only after I had used tape for a while that I found out that it was also written by James Halliday. tape can be installed using npm. Tape's output is in the TAP format (Test Anything Protocol) which, by default, is extremely verbose. Most often, it is recommended to pipe the results into formatters which produce more readable results. Depending on what I am doing, I use different formatters, some more verbose than others. After trying out about a dozen formatters, I now use faucet by default. faucet can be installed using npm and has been written by, ... you guessed it, James Halliday. Unit tests are fine, but they miss problems arising from putting all the code together. I used different strategies to do integration testing, all of which seem to create almost more problems than they solved, until I stumbled upon a very easy way that just works for me. Using a Python script, I take the single html file for my site, put all the code inside an html div with display set to none, insert some qunit code and my own tests, and let everything run. To help identify potential problems with circular dependencies, I use madge, which can be installed with npm. There is one remaining dependency in my code, which I silence by not inserting a require() call in one of my modules: when the site is initialized, I want to draw a default version of the world which I by calling functions in the drawing module when loading some images. Later, when calling the drawing module, I do need the definitions found in the module where I load the images. I could get rid of the dependencies at the cost of duplicating some code ... but since the initializing of the site and the execution of user-entered code are done in separate phases, the circular dependency does not cause any problems. 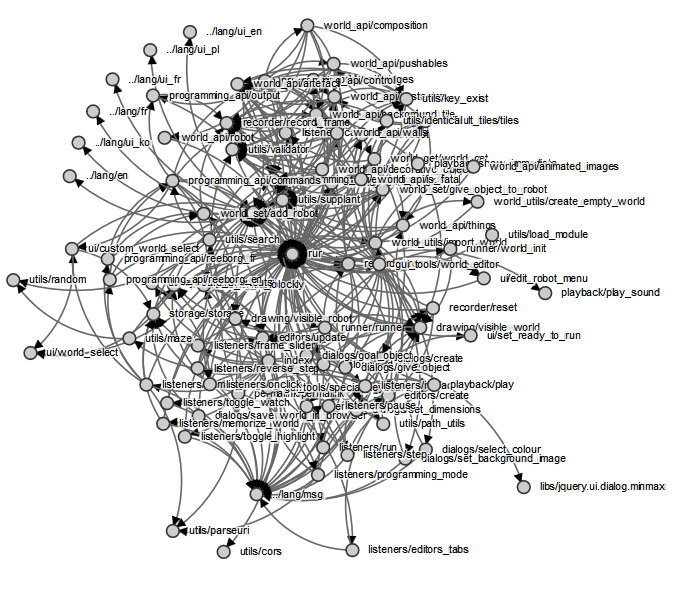 The image of the tangled mess of modules shown above was created using dependo. As I was refactoring code and adding various require() statement, dependo was helpful in identifying any module not included, either because they had been accidently forgotten or because they had become irrelevant. dependo can also be installed using npm. While I do not particularly like it, as I cannot figure out how to extend it to address my particular needs, I found that jsdoc useful to produce an API for people wanting to use advanced features in creating unusual programming tasks (aka "worlds"). When I started using it, there did not seem to be any easy way to use Sphinx to create such API. I gather that this might no longer be the case ... but it would likely require too much effort to make the change at this point. jsdoc can also be installed using npm. A linter can often be useful in identifying potential or real problems with some code. When I started working on this project, the only linter I knew was jslint. jshint is friendlier and more configurable to use, and is my preferred choice. And, you guessed it, jshint can be installed using npm. Language support can mean one of two things: either the programming library for users (like using "avance()" in French as equivalent to "move()" in English, or for the UI, or both. Currently, French and English are implemented for both, while Korean and Polish are only available for UI. Work is underway to provide Chinese support for both. The tutorial can be found here; you can change the default language using the side-bar on the right. The repository is at https://github.com/aroberge/reeborg-docs. The tutorial is currently available in French, English and Korean, with additional languages in the works. https://github.com/aroberge/reeborg-api is a documentation site for the API that creators of advanced tasks can use. https://github.com/aroberge/reeborg-dist is for those interested in installing their own version of Reeborg's World by simply unzipping a file, instead of cloning a repository with unnecessary files. 55 seconds versus 20 seconds: this is the reason why I am switching from Chrome to Firefox for my automated tests. I normally wouldn't write a blog post about what browser I use for testing but I found the difference between the new Firefox and Chrome so striking that I thought I should write about it. If you want to know the details, please read on. I run functional/integration tests using Qunit. For many years, I have been using Chrome as my browser of choice for development. However, after testing the new Firefox version, I am definitely making the change. Here are the numbers, and how I obtained them. I ran each testing sequence 5 times. Firefox (v 58, 64 bits): 3 seconds. Yes, measuring with my watch is not precise; however it is precise enough to distinguish between 3 and 12 seconds. Firefox: between 16 and 17 seconds. So, including the time to load (measured by my watch), it takes approximately 55 seconds to run the test suite using Chrome, and approximately 20 seconds using Firefox. This is why I am switching to Firefox. As I was curious, I also tried Microsoft Edge. While Edge can be used apparently without any problems on my public site, it hangs inexplicably when trying to run tests from my local (Python) server. Thanks to Adam Jurkiewicz, Reeborg's World is now partially available in Polish.